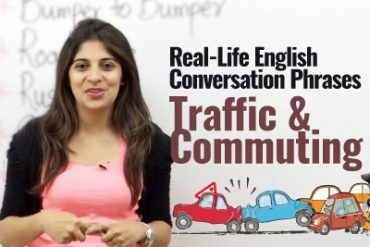 Hey English learners, this video comes as a surprise for you. 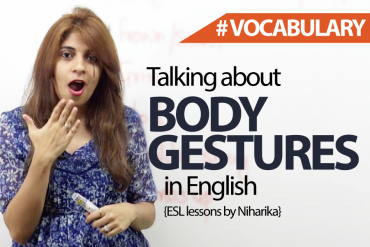 It’s not another English lesson by Niharika. In this video learn about the worst body language mistakes that turn people off, maybe you are making these non-verbal communication mistakes unknowingly, but that put up a bad impression in public speaking. 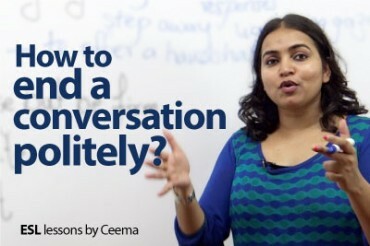 Watch the video carefully as Niharika demonstrates the correct body language training to avoid mistakes with your non-verbal communications skills. Even when you are learning to speak English fluently, why not correct your body language while speaking English to sound more confident in your English conversations. The broad topics covered in this videos are Eye contact, hand shake, slouching, folded arms & the message they convey, frowning & scowling, Invading others privacy and space, fidgeting, Glancing at the clock. We hope these tips for body language and communication skills would help you develop a good impression and would not turn people off when the interact with you. What exactly is body language? Well, body language is your nonverbal communication, which means you’re not doing the talking but it’s your body, your physical behaviour, your hand movements, your facial expressions are speaking for you. So in the real world when you make these body language mistakes you don’t come out as a confident person. Now, probably you are making these mistakes unknowingly but it’s important for you to notice them and work on them. So we are gonna look at eight worst body language mistakes that probably you are making unknowingly. So let’s have a look at the first one. The first one is avoiding eye contact. Well, at times when we are talking to people, you get a little distracted or probably you are so nervous that you fail to make an eye contact while you are speaking. So what happens is when you are speaking or when you’re talking to that person you do this, oh yes, I actually did that but it failed. So when you are not looking into the person’s eye, it shows that you’re either nervous, you’re not confident about yourself and you’re being a little disrespectful. So you definitely don’t want to show these emotions. Probably it’s just that you’re nervous but then try to work on this and having an eye contact is extremely important. So this is the worst mistake that you are making if you avoid eye contact while talking to a person all right. Let’s move on to the second mistake that people make is slouching. When you are talking to someone and you’re not standing, your body posture is not straight but you are slouching. You’re talking like this, mm-hmm, all right, I’ll do that. Well that is a mistake because when you slouch in front of people while talking to them, imagine he’s a very important client and she’s slouching in front of him and you’re talking to him, it shows that you’re not confident you have very poor self-esteem and again you have no energy levels all right. You’re not very excited about the job. You’re just so bored that you are slouching. So if you slouch then please stop doing that because this is one of the worst mistakes that you’re doing all right. The next one weak handshake. When you shake hands with someone, it has to be a very firm handshake. Make sure that you give a firm handshake to the people that you meet because it’s a sign of authority. It’s a sign of confidence. When you give this poor handshake or a one little finger handshake no point. It just shows that you are least interested in shaking hands or dealing with that person. Again, there are people who shake hands in a very aggressive manner. It’s a very, very, very firm handshake, that is also not acceptable. So not an aggressive handshake where you just press that person’s hand so bad that it just starts hurting. So do not do that and please avoid making a weak handshake all right. Let’s move on to another mistake that you might probably make which is, arms folded. You’re talking to someone, you’re giving a presentation, you are in a meeting and your hands are folded. Well, when you are talking; make the use of your hands because using hand gestures really help. It just shows your confidence and it also helps you to buy words okay. So it just gives you the time and it just explains you much better in front of a person. So when you are presenting something or when you are in a meeting, then try to use your hands while you’re talking rather than folding your hands. Again it just shows that you nervous, you’re not confident and you’re not interested. Okay so if you fold your hands while you talk, stop doing that, just open up and start using your hands just the way I do all right. Let’s move on to another mistake which is frowning or scowling. When you walk into an office and you see people who are frowning, who are making these awful facial expressions while they’re doing their work. For example, oh I gotta send this email. Well these expressions show that you’re bored, you’re unhappy and you least interested in your job. Also when you’re talking to a person and you make these weird frowning or scowling expressions, do you think the opposite person would be interested in talking to you? Imagine I am talking to you like this, all right people y’all are making these mistakes and it’s not acceptable. Well, that is not fun you would not really like to watch my lessons if I talk to you like this. So no frowning or scowling, which shows that you’re bored, you’re least interested and you’re unhappy with the things that you’re doing. So stop making these awful facial expressions. Let’s move on to another mistake which is invading others’ space. Well, there are people who love to invade others’ space. For example, you’re at your workplace and your co-worker comes in and just sticks around you way too much and you don’t want that. You want him or her to maintain distance. There are people who treat your possessions or your office space as if it’s their own. You don’t want that because they are crossing their personal boundaries. It’s important to maintain your boundaries when you are talking to a person or when you are visiting someone’s desk. You can’t just stick around all the time and you just can’t keep seeing what they’re doing all right. That’s not acceptable. So stop invading others’ space, maintain distance, maintain your personal boundaries all right. The next one fidgeting, imagine I am teaching you something and I’m fidgeting with my marker, with my hair or I am biting nails while I’m teaching. Well that’s not acceptable, right? So again when you are fidgeting with your phone, these days people love their phone too much. So when they’re in a meeting, when they are in a presentation, when they are talking to people, they keep fidgeting with their phone or they keep fidgeting with their hair, they keep biting their nails, that’s not acceptable people will not appreciate that and it just shows that there’s no interest, you are bored and you are nervous okay. It’s also a sign of nervousness. So stop fidgeting with things when you are talking to people okay. And then the last mistake that I would like to tell you that usually, people make unknowingly is glancing at the clock. We all want to go home early. Yes, we do. We don’t want to stay back, we don’t want to too much. So we want to go home and then people get into this habit of glancing at the clock or glancing at your watch. Do you do that? Probably you’re doing it unconsciously but then you need to notice and you need to stop making this mistake. Everybody is in a hurry but every time you’re talking to a person, your boss is giving you some pointers, your co-worker is talking to you and you keep glancing at the clock that what time is it? I need to leave or I’m getting late that’s unprofessional. People will not like it and your boss would definitely not appreciate it. So stop glancing at the clock or your watch all right. Finish talking and then probably you can rush back home. So these are the eight worst body language mistakes that you are making. Please do notice these mistakes and work on them so that you come out as a very confident person and I’ll be back with a new lesson soon till then you take care and have a great day.